Report: President Trump leaked highly classified information to Russian officials. 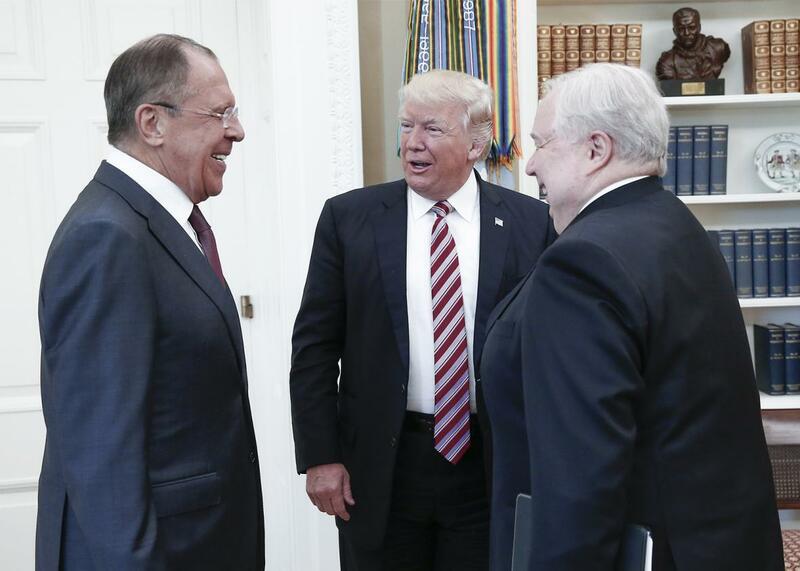 Russia’s Foreign Minister Sergei Lavrov, US President Donald Trump, and Russia’s Ambassador to the United States Sergei Kislyak (L-R) during a meeting in the Oval Office at the White House. According to U.S. officials, Russia has an interest in locating, identifying, and “disrupting” the source of the intelligence Trump discussed—a source that could also be delivering intelligence about Russian activities in Syria. “I don’t think that it would be that hard [for Russian spy services] to figure this out,” a former intelligence official told the Post. Update May 15, 7:20 PM: H.R. McMaster just gave another brief statement to reporters outside the White House. This time, he explicitly denied the Post’s reporting. “The story that came out tonight as reported is false,’’ he said. “At no time were intelligence sources or methods discussed.’’ Again, the Post did not report that Trump divulged specific sources or methods. Both McMaster and deputy national security adviser Powell were in the meeting with Trump.